Today I woke up with a messed up stomach. Go figure. But it all sounds so good. Can’t you use the excuse that baby demanded it and that you took one for the team? I did hear that the In-And-Out burger was ambrosia hamburger-ified. Besides, Nilsa has a faboo idea up there. I’m with Nilsa on this one 🙂 I don’t eat beef but even I think that burger looks delicious! mmm but man at least it was tasty right? This post made me laugh & smile. It's like you've eaten in one day all the fat you've avoided for a year. call me crazy, but that sounds like the perfect diet!when in doubt, blame the baby. this will come in handy for years to come…. Your stomach was probably all “VEGETABLE!” Hee hee. Just wondering, but what ever happened to the “not eating red meat” idea?? 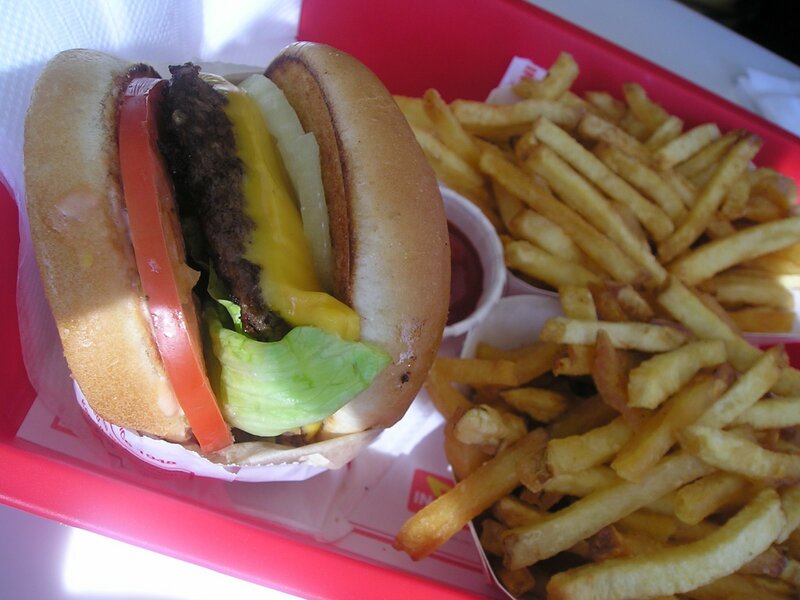 Our nutritionist said In ‘n Out is actually not bad for you b/c of high quality ingredients and freshness. But the pizooki…boy they’re good on the way down, but they make me sick an hour later every time I’ve got them! Eh. That’s unfortunate your tummy was giving you problems the next day. (Mine would be doing the same thing.) The cheeseburger and fries look heavenly, though..
Hey now, that is the advantage of being pregnant, right? You gotta use the stereotypes about cravings for something!! i have been to california many times but still have not had an in and out burger!! i really want to..